Not sure I would like to see Harry Potter put into an Anime series let alone a TV series. Even though you would get to see a bit more. I don't think it would be as successful as the movies and definitely wouldn't make as much money, and lets be honest that's what it's all about these days. I mean, it would be interesting what would they come up with. But agree with most people here in the fact that we already know what happens. I really like this idea. We could get to see more in the series, that's not in the movie. Actually I remember seeing someone put a intro animation to an authentic looking Harry Potter anime on deviantart. That was years ago though. Anime can be in different styles, people who don't like anime only see ones that are the exaggerated, kid-friendly genre's. Having seen very limited anime in my life (Does Dragonball Z count? ), I personally don't think it will work but as I said I'm no expert in this field really. Although I love anime artwork personally. I wanted to ask about the copyright issues though, doesn't WB have it for like eternity basically? I don't know if WB has a anime branch? Otherwise I don't see them letting anyone else use it to make an anime especially if it's a Japanese company or a rival American one. "Has Ron saved a goal yet?" asked Hermione. "Well, he can do it if he thinks no one is watching him," said Fred, rolling his eyes. "So all we have to do is ask the crowd to turn their backs and talk among themselves every time the Quaffle goes up on his end Saturday." I don't know if WB has a anime branch? Otherwise I don't see them letting anyone else use it to make an anime especially if it's a Japanese company or a rival American one. Anyway it can definatly work,the advantage of animation is that you have no limits to what you can create , you just need to draw,while in live action even if they have a huge budget,it's not infinite. But if there's an anime , I demand the music for the show to be made by Yuki Kajiura. 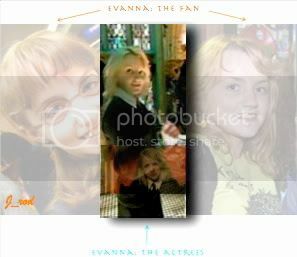 Evanna on filming OoTP:It reminded me of playing the Sims (except that my Sims often die). Evanna at the movie premiere:It just feels unnatural you know...like,I have this impulse to jump over the barrier and start screaming "Daniel!" I think this would be feasible depending on which plotline the anime takes place, the modern films or the less modern books starting in 1991. I would love to see the Harry Potter series in an all different view!! But if it'd happen, then it'd be interesting. I'd watch it. I do hope they follow the story in the book. Since Harry Potter is entitled to J.K. Rowling and all. I'm not really a fan of the idea, honestly, though. 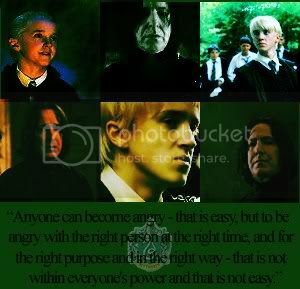 I know I'm wrong for closing my heart in liking different versions aside from the movie and the book. I was wondering how awesome, in my opinion, it would be to have the HP books divided in to a Cartoon-Film (I mean a thing like final fantasy or even better as graphic) series, actually directed/produced by JKR, of maybe 30 minutes episodes. I'd like it to be absolutely 100% canon, so we could see every single moment in the books on screen and maybe added scenes/content actually coming from JKR. I really love this idea what do you think about it? I just wanted to know your thoughts on this. I've been thinking about it since I first started reading the books. Do you think they will ever produce an animated series for harry potter? I was thinking it could be like a serial with 7 seasons. Imagine: 10-15 hours for each book! That should cover all the details that were originally in the books and never made it to the movies. It will take a looot of work and creativity to produce something like that but it will be definitely fun to watch, and it will add something new instead of remaking the movies. I like the idea of watching a anime of Harry Potter and seeing what the HP world looks like in animated form. There is a lot of HP artwork in manga style so I can see it working. But don't know if I would watch it religiously like I've read and watched the HP movies. It might be slightly boring because I already know what is going to happen. But if they showed the Harry Potter story from another character's POV (like Neville's or Snapes!) than it would be really cool! I love this idea. What I love about anime is how something you can initially look at and think is kidish can change your mind in a heartbeat. I think HP would be perfect as a anime because it wouldn't be limited to what it can do like a live action TV show would have. I think it'd be really cool to see, although unlikely. 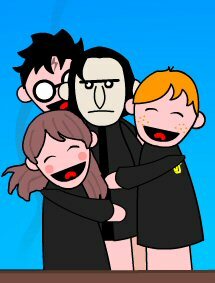 There are a lot of Japanese fans of HP so maybe one day it could happen if they got the rights to make an animated series. The only problem with this approach is that while there is a lot in the books that can't be covered in the films, there is definately not enough content in the books to fill out the amount of episodes required for each season/series (be it Japanese or American). Even with adding entire filler episodes that just deal with ships and things like that there still isn't enough there to keep a Hogwarts year going on for a full year--or even just nine months--of television. I guess this could work if two Hogwarts years went by in one television year with maybe only OotP taking up a full year of tv? It's not impossible though, it just needs a lot changes and tweeking. It would be so much fun to have a new theme intro for each year as the kids get older and stuff. Not enough in the books? Are you serious? Plus its a way for JK to add more stuff to the side stories in those books. I've mentioned this before, but I'd like to see the books re-adapted sometime in the future as seven multi-part animated TV miniseries, each one divided into several hour-long installments. You could fit in more key plot points from the book that way, and the episodic nature of each series would keep the later plot-heavy installments from coming across as too slow or bulky. And as a die-hard animation fan, I've always been of the opinion that it's the best medium to tell any story. Not necessarily an anime, because I don't really think a Japanese drawing style fits these characters that well, but definitely animated. I have heard rumors about a Cartoon TV series. How popular is the anime market right now? Would it be feasible? Most of what I hear people are into seems to be older Anime series.. Probably will never happen. But fanart done in Anime Style is still awesome.